A Boutique Inn with a point of view overlooking Lake Michigan. Bay Inn of Petoskey, continually operated since it was built in 1960 by local entrepreneur Dr. Christian Jensen, offers exceptional hospitality to the visitors of Petoskey. Call today and visit soon. Call 231-347-2593 for weekly specials or click here for Packages & Promotions or details about our private Guest Cottage, available for daily, weekly or monthly rental. Innkeepers Shirley and Verne Osterlund will welcome you upon arrival and assure that your expectations are met during your stay. Originally from the Birmingham-Bloomfield area, both attended high school in Royal Oak, Michigan. Verne graduated from Lawrence Tech while Shirley received a BSN from Oakland University which lead to a lengthy career at Beaumont Hospital in Royal Oak. 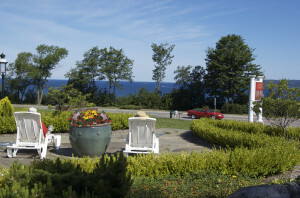 Shirley and Verne decided to make the move north and purchase Bay Inn of Petoskey in January 1999. The move came after a twenty-year career operating the successful St. Christopher Inn located in Bloomfield Township.